Commerce requires the movement of goods and services. The item you order from Amazon has to come from their warehouse to your door and that item had to come from a manufacturer to their warehouse. Bulk commodities are best shipped by rail or by barge. Fast shipments require air. 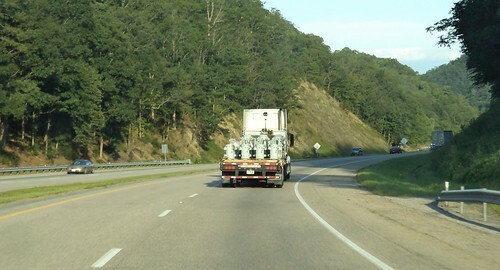 Most shipments are via truck. You can see the life of America on her arteries, the Interstates. This is a blurry photo, I admit. As I closed in on the truck, I really couldn't tell what those were. From this distance, those are round items, like balls, but what kind of balls are shipped in red-orange string bags and in sufficient quantity to merit a whole truckload? It wasn't until I was passing him that I realized what these were. 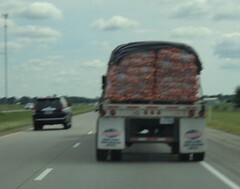 Onions, a whole truckload of onions in 50 pound bags. Onions don't benefit from being shipped in a refrigerated trailer, in fact, that kind of cold will rot them from the inside out. There was a tarp over the top but they had been merely piled on top of each other and strapped down. I passed this guy twice before losing him in the hills of eastern West Virginia. It's kind of hard to see his cargo. If you click on the photo, you might get a better view of it. Transformers for electrical poles, a whole flatbed full of transformers. The way they are placed on the rig and the design of the transformer made them look, to me, like the heads of people. There are fat, curled wires coming out of the top that remind me of hair. There are two dark spots on either side of a metal extension that look like eyes and a nose. Under this extension is the number "10", which looks like a mouth. I had the thought that if you painted them yellow and used the previous onions as goggles, they would look very close to these. 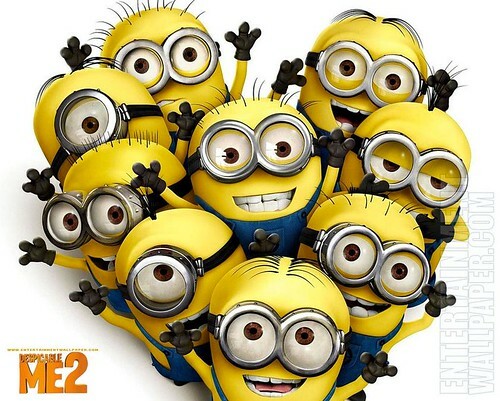 Can you imagine a truckload of minions? There are no adequate words for that kind of awesome.